Raaga.com: WHAT? Hrithik Roshan's mother Richa Chadha??? WHAT? Hrithik Roshan's mother Richa Chadha??? OH No!! Come Again?? No no no... This would have been anyone's reaction when they hear this news.... 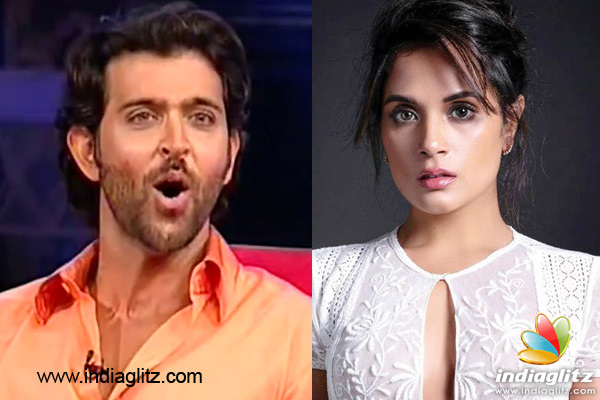 It is said that the charming young talent Richa Chadha was offered the character of mother to the handsome heartthrob Hrithik Roshan! Yes you read it right...! But this was way long back, when Richa was all the more younger - that is, 25 years old then... In an interview, Richa revealed that she was offered to play Hrithik's mother in 'Agneepath'. And the reason for choosing her was that Richa was essaying Nawazuddin Siddiqui's mother in 'Gangs of Wasseypur'..!!! OMG! Just imagine the poor actress's state of mind of having to play mother to the most good looking actor in the industry! PHEW! As they say, rest is history... Richa will soon be seen on big screen with 'Sarbjit' and 'Cabaret'.